What are the Greenhouse Gas emission reductions (GHG reduction) caused by solar energy? A Greenhouse Gas (GHG) is a gas in the atmosphere that traps heat between itself and the earth’s surface. Thus it has a warming effect. The main contribution to warming on earth (a 2010 estimate ) comes from water vapor and clouds (75%), carbon dioxide (20%), methane, ozone, and some other gases and aerosols contributing the remaining. 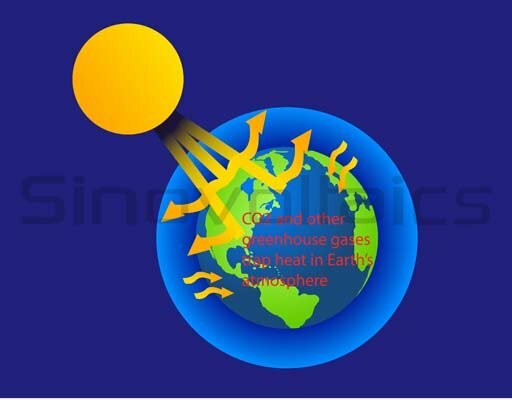 The greenhouse effect of these gases was originally a blessing of nature because without these the average atmospheric temperature would be about 15°C lower. That would make life on earth very difficult. At the same time, however, if the effect increases even slightly, the temperature will rise (global warming), and threaten human life.Unfortunately, with industrialization, a lot of fossil fuel is being burnt which leads to increase of greenhouse gases in the atmosphere. Generation of alternate energy (meaning alternate to fossil fuel) like solar, wind etc., does not directly involve generation of greenhouse gases, and is environment friendly. However, to start with, some fossil fuel must have been burnt to produce the infrastructure for a given type of energy. The mass of greenhouse gases (GHG) produced to set up, say, a solar PV system, divided by the expected total energy output expected during the life cycle of the (total) system is called the GHG equivalent (GHGe) of a PV project. GHGe of distributed solar PV using current technology has been estimated to be 46 g / KWh. In comparison, GHGe of oil is 893g/KWh, and of coal, 513-994 g/KWh. If we use solar PV instead of oil to generate energy, for every KWh we avoid emission of (893-46) or 847g/KWh of GHG. That is a huge reduction in GHG emission (compared to oil energy). That is one of the prime reasons for the drive towards alternate energy of which solar energy is an important one. These emission figures are averages. Actual values depend on the actual implementation of a project. As technology improves, GHGe of solar energy will also reduce, increasing the value of emission reductions. GHG equivalent of distributed solar thermal is estimated currently at 22g/KWh, which means an emission reduction of (893-22), or 871g/KWh compared to oil. To quantify the emission reduction effort of various governments and business entities, the emission reduction unit (ERU) has been defined as any activity which avoids the generation of one ton of carbon dioxide (or its GHGe).